Based on discussions and from seeing the strategies many novice traders are operating off of, there is one thing that stands out. Successful traders are getting out of their trades just as novice traders are getting in. Successful trades look for open spaces where the price can run, and when the price looks like it will turn and head into one of those open spaces, these traders jump in. Successful traders are also out of their trades before the price hits potential support or resistance areas. When the price reaches those support or resistance areas this is where novice traders start to get interested, looking for breakouts. Unfortunately most novice traders believe they are trading the open spaces, but often it is a lack of perspective which leads them astray. 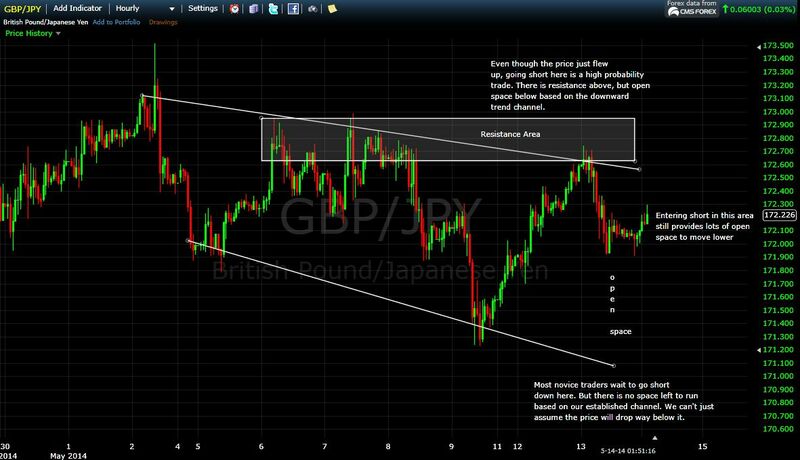 Figure 1 shows an hourly chart of the GBPJPY. This concept applies to all time frames. First notice a few things about the chart. I have drawn a very crude trend channel establishing the price direction on this time frame. I have tried to draw the channel through major tops and bottoms, drawing the channel smaller than it actually is. I have reduced the open space and in doing so make my expectations conservative. I only assume the price will run to my conservative trendlines. I have highlight a major resistance area which forms a nice entry area for when the price pops back into it (as it did on May 13). The price enters the resistance area while in a downward trend channel. By taking a trade at the top of the channel–and I can only assume the channel will continue since there is nothing to indicate otherwise (yet)–the price has loads of room to fall back to the bottom of the channel, but very little room to run higher based on resistance and the channel top. Novice traders like to go long after a strong run (like in the resistance area) or at the bottom of the channel expecting an even more severe decline. But we can’t just assume that because we took a position the market will do what we want. Here’s the thought process for the trade. Where is the price in the structure (channel)? And is it a downtrend or uptrend? If the channel is down, I want to short near the top of it, or on a pullback within the channel where there is enough room for the price to run to the bottom. If the price is right at the bottom of a downward trend channel, I leave the trade alone. If the channel is up, I want to go long near the bottom of the channel, or on a pullback within the channel where there is enough room for the price to run to the top of the (conservative) channel. When the price recently moved to the top of the channel, even though it just had a very strong run up I wanted to get short. I did so in the resistance area (see The Valley Floor Trading Approach). Now the price is near the middle of the channel. There is resistance above, and still room to move to the downside, so I still prefer being short (buying puts). I don’t know which way the market will go. It could move higher, and that is ok, I will just have a losing trade. But more often than not this process of looking for open spaces works. I trust the structures the market is moving within, until there is evidence to the contrary. Evidence to the contrary includes: instead of the price dropping it rallies above the prior high, and moves above the resistance area. If that occurs, the structure has changed and I need to adapt. I then go through this whole process again; draw new lines based on new channels that are forming and once again look for open spaces I can trade. Draw “conservative” price structures on your chart. Typically I find when I draw lines most often I see channels, wedges or triangles. These help establish resistance and support areas. Assume these areas will hold until proven otherwise. That means trade in the direction of the trend, in conjunction with the structure, and only when there is lots of room for the trade to run in your direction. This requires a leap of faith, but such leaps often provide fantastic prices. As always, make sure you have a well defined method of managing risk and picking your entries (and exits if trading traditional markets)…and go through the same process (mental and physical) each time you place a trade.